One (eventually) happy family; image courtesy of MGM. Thanksgiving isn't given much of a spotlight nowadays. Somewhere along the way, the popular media has come to view it as a pre-party to Christmas. However, I still think there is something to be said for having an autumnal holiday that give us pause to reflect on one's blessings. Over the five-plus years that I have maintained this blog, it has paved the way for so much good in my life - a column in my local paper The Sewanee Mountain Messenger, and a regular gig writing reviews for AudioFile Magazine, a prestigious publication based in Portland, Maine that is the definitive go-to for everything in the audiobook world. This has all happened because of you, dear reader, taking the time to stop in and enjoy this blog, and for that, I am deeply thankful. 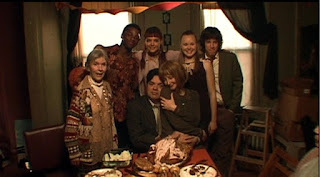 As a thank you, I'm sharing a review of one of my favorite non-mainstream Thanksgiving films that has become a tradition to watch because it so touches my heart every time. Drink, be merry, and happy viewing! There's one in every family - the black sheep, the renegade, the one who won't settle down and do what's expected- and that is exactly what April is. Masterfully played by Katie Holmes, April is a 20-something New Yorker who has invited her conservative family and bitter mother who's recently been diagnosed with cancer to her tiny apartment for Thanksgiving. As she is attempting to create a full-scale dinner to impress her incredibly judgmental family, everything goes wrong - from dropping the turkey to a burned out oven. As the film intersperses shots of her family in the car making snarky remarks about how awful it is all going to be to April desperately trying to piece it all together, something beautiful happens: the other tenants in the apartment complex begin to pitch in and help bring the meal together. What impresses me most about this film is its unflinching realism of family drama juxtaposed with the optimistic joy of reunions. April's mother is played by Patricia Clarkson, who was nominated for an Oscar as best supporting actress. Clarkson is surprisingly vicious when it comes to her views toward April, and this kind of no-holds-barred honesty is equally refreshing and uncomfortable. There are so many holiday films that either make light of or gloss over family issues, an inevitable part of the picture. But what director and writer Peter Hedges manages to do is to walk a fine line between optimism and cynicism, and show that when it all comes together - its just about BEING together. With a plethora of zoomed in shots of people's faces and their reactions to surrounding people and situations, the film is an intensely personal experience; a dedication of sorts to Hedges' mother, who died of cancer. It available for streaming starting at $2.99 on Amazon.com and available for DVD rental through Netflix. Rated PG-13 for language, sensuality, and drug content, this one is best viewed by older children and adults after the pumpkin pie has been passed around and the teenies are tucked in bed. Toby sez: A uniquely told tale that incorporates the ideals of thankfulness- and that you don't have to be related by blood to be family. A sure winner for those who need a break from football.